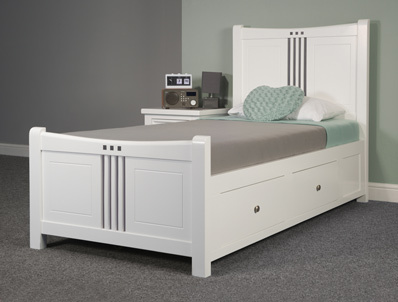 The Cruise is a new wooden bed frame that is available in 2 colourways white with Black detail and white with Grey detail , Made from pine mainly the bed frame has 2 built in drawers on each side . The Louis bed frame is available in 4 sizes Single, Double, King size and super king size and in 2 colourways with the option of matching furniture . Bed frames and wardrobes are flat packed all other items are delivered assembled . Delivery is Free of Charge to most areas in 5-7 working days to most areas of England , Wales and lower scotland , please note central and scottish highlands and offer postcodes like LL and SA will incur a delivery charge and a extended delivery period , for more information please see delivery page.